Boil water in a large vessel adding salt. 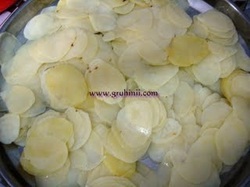 Peel the potatoes, cut them into thin slices and add directly to the boiling water. Switch off the flame and keep it closed for some time using a lid. Now drain the water and place them on a clean towel. Take oil in a pan and deep fry the sliced potatoes. Drain on paper towels and store in air tight container. 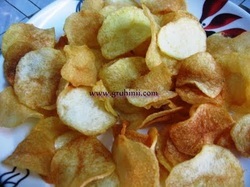 Crispy potato chips are ready. Enjoy.